On this day in dinosaurs, one of the most iconic Walt Disney World attractions closed for refurbishments, never to be the same. After more than a decade of entertaining park guests, Disney opted to reinvigorate its Universe of Energy pavilion in early 1996. The ride featured animatronic dinosaurs similar to those first used in the 1964-65 World’s Fair for the Ford Magic Skyway exhibit. 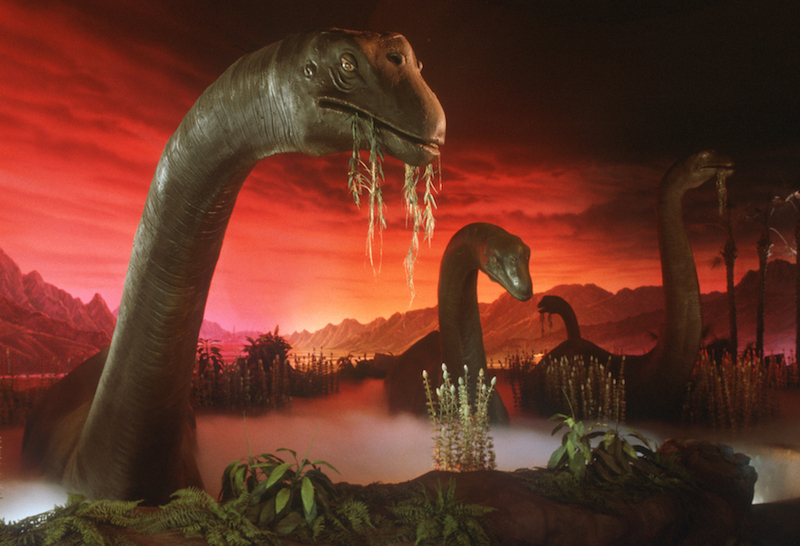 These dinosaurs were later moved to Walt Disney Land in California and became part of the Disneyland Railroad. For Disney’s EPCOT Center in Orlando, Florida, the dinosaur era was set as part of the larger story of how humanity produces energy–powering civilization through the use of fossil fuels. Universe of Energy was reopened briefly (with minor alterations) for the summer of 1996 when peak season tourists would be keen to see the dinosaurs. But it was closed again in September to allow the final changes for the ride’s new features. Just a few weeks later, Ellen’s Energy Adventure opened to the public, incorporating Ellen DeGeneres and Bill Nye the Science Guy into the show’s narration and even into some of the moving dioramas. Several minor updates have been made to the pavilion over the years, but either the story of Earth’s energy either has become outdated as EPCOT becomes more focused on thrill rides and Disney franchise attractions, or fossil fuel production has become too political an issue for Disney. In either case, the ride is rumored to close in order to make way for a Guardians of the Galaxy roller coaster. Share your favorite memories of Universe of Energy or Ellen’s Energy Adventure with us on Facebook and Twitter using the hashtag #TDIDinos.